Over the next few weeks, we are preparing for the publication of our book, Writing with Mentors, by sharing our most popular mentor text-related posts over the last two years. This week, we are sharing “Questions to Help You Choose Mentor Texts”. Finding the right mentor texts can be daunting in a world full of words, but asking yourself a few strategic questions can make the tasks easier, more fun, and give you a systematic way to approach the process! 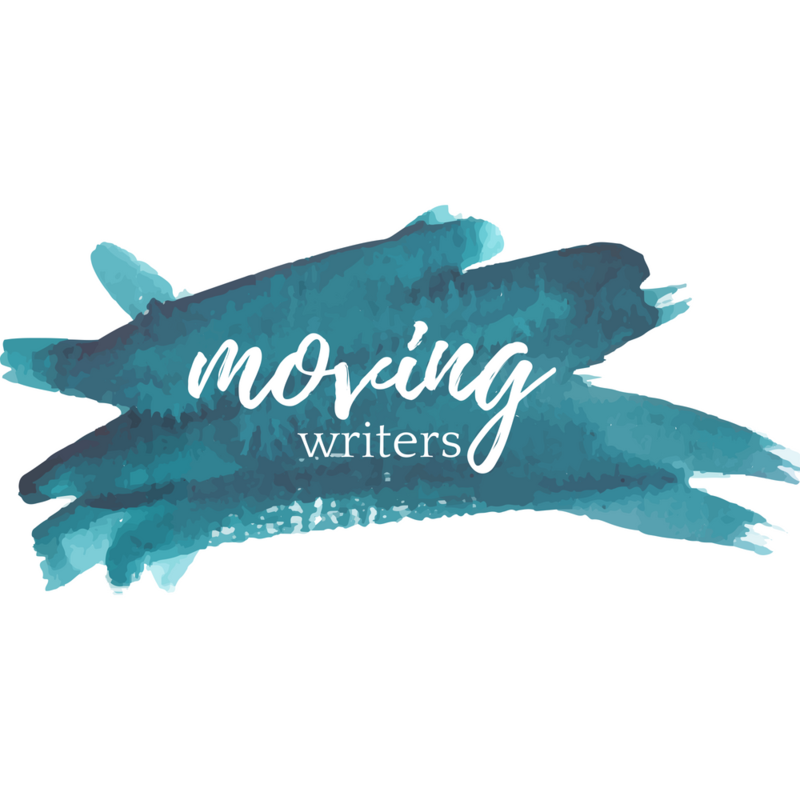 We’ve also added a new way that you can connect with us and join the Moving Writers conversation — we’re on Facebook. Like us on Facebook (www.facebook.com/movingwriters)! Do you remember Captain’s Choice? Those moments standing on the field during gym class as the boys and girls carefully selected players for their teams? We can still see their eyes darting back and forth as they sized up their potential teammates. For some of them it was – and still is – serious business. They had real selection criteria.How fast is she? How much experience does he have? How many goals did she score last week? For some of us, it was a painful experience. But looking back, we don’t begrudge them. We realize now they were simply trying to build the best possible team. We think about these boys with a smile now as we select mentor texts to support our current study. Like them, we mean business. In a world full of mentor texts, we have to choose the ones that will best engage and inspire our students and move them forward in their writing. The ones that will give them a vision of the writing they’re about to do — and a text to shepherd them during the writing of it. And like the athletes of our fifth grade gym class, we can’t risk choosing the wrong text and losing our students along the way. So we have some selection criteria, a series of questions that we ask of potential texts, as we go in search of the best models for our writers. Gather a few texts that you’ve come across in your reading. The questions are ordered from most to least important, so, beginning with one text, ask of it the first two questions in the left column. (The questions in the follow-up column are designed to give you more information about the primary questions or help you probe the texts more deeply.) These questions will help you do a first-round vetting. If your mentor text does not pass the engagement test and the highlighter test, it’s probably not going to work for you and your students. Next you should consider accessibility, length, and the writer’s larger body of work. 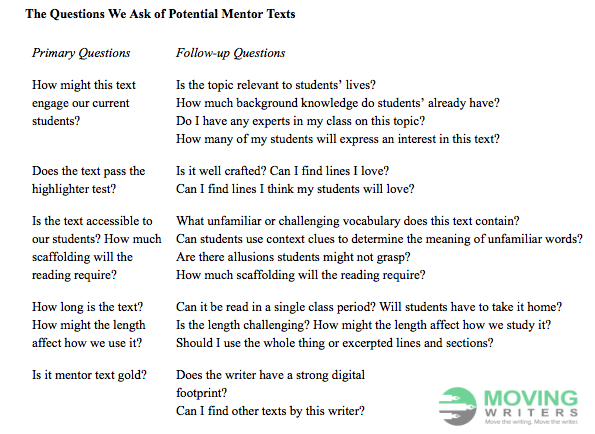 Running each mentor text past these questions will help you select a strong cluster of texts for your study. The topic of selecting mentor texts comprises a good portion of Chapter 2 our book due out in September! We can’t wait to share it with you. In the meantime, please feel free to share your process for selecting mentor texts, and as always, forward any mentor texts you’d like us to add to the Dropbox our way. You can reach us through the comments below, on Twitter @allisonmarchetti @rebekahodell1, and on Facebook (www.facebook.com/movingwriters).